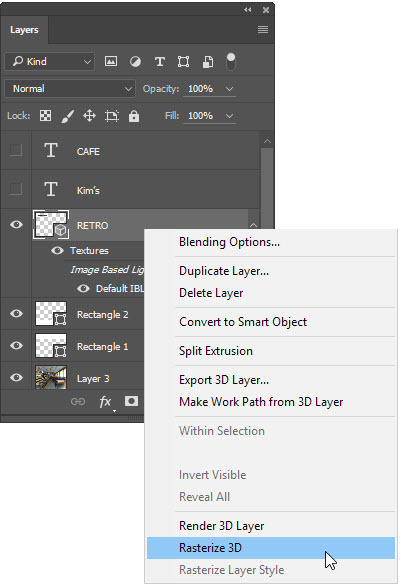 Photoshop offers many 3D options for both image and text layers. 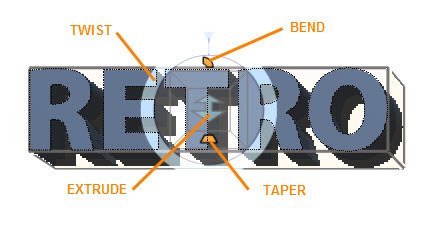 In this example, a 3D extrusion will be applied to text. Note: 3D modeling in Photoshop is processor-intensive, so if you've seen a message when launching Photoshop about insufficient vRAM, you will not be able to work in 3D. 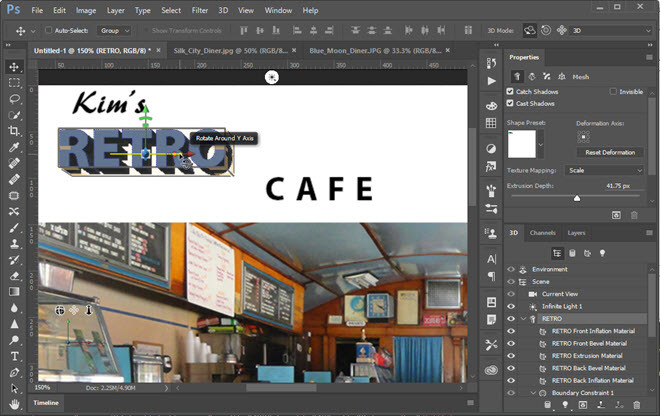 Using the Type Tool, make the text layer the active layer and then go to the Options Bar and click 3D. A message will appear about switching to the 3D workspace. Click "Yes". When the 3D workspace is active, a Ground Plane grid and Secondary View Panel will appear. 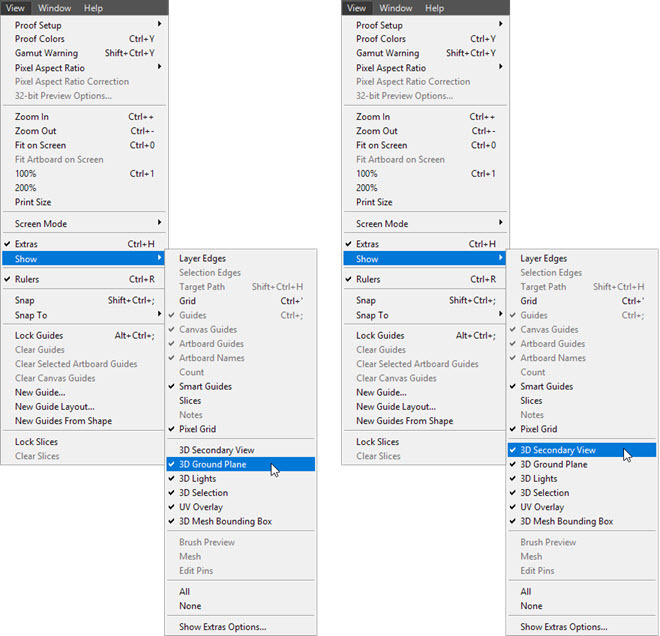 These can be turned off by going to View > Show > 3D Ground Plane, then going back to View > Show > 3D Secondary View. 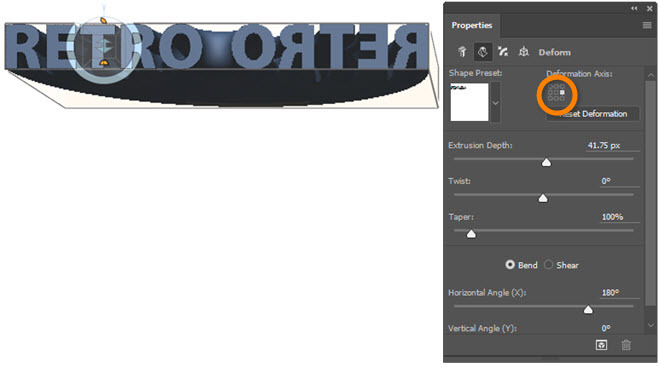 The 3D Proxy Tool will appear on the text. There are three arms for controlling the X, Y, and Z axes, and the sections of each arm have different controls. Hover over different sections in each arm and note the tool tips. You'll also see that the 3D panel is open. 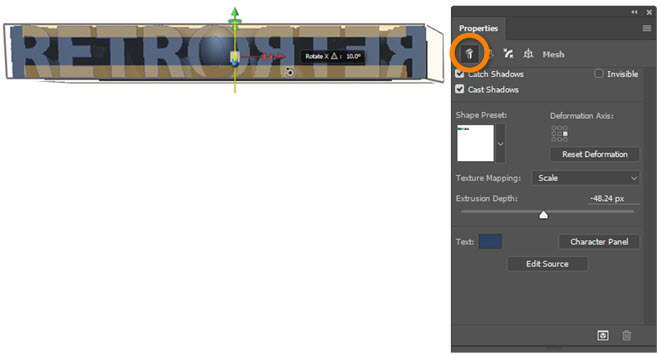 Click on the text object in the 3D panel, then look at the Properties panel. When the 3D object is selected, the Properties panel can be used to control different elements of the 3D environment. Mesh – Refers to the overall 3D shape, which in this case is defined by the text. Deform – Controls depth, twist, taper, bend, and shear. 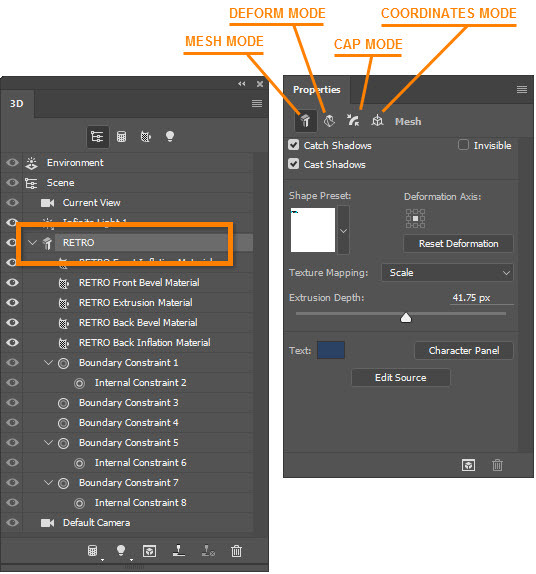 Cap – Controls the bevel and inflation applied to front and/or back surfaces of the 3D object. Scene – Refers to the angle the 3D object is viewed from. Click the Deform button in the Properties panel. The text now displays the controls. 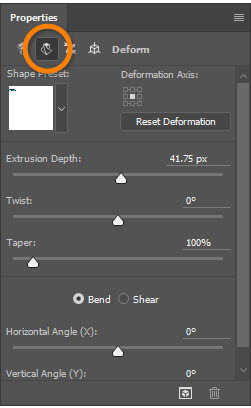 In this example, I'm going to create an effect where the text is mirrored and extruded by clicking and holding on the Bend control, then dragging right until the tool tip shows Bend X: 180° (approximately). Next, I'll go to the Properties panel and click the right-center point in the Deformation Axis Proxy. Now I want to move the two sides closer together, so going back to the deform controls on the text, I'll click and hold on the Extrude control and drag down. I don't want the bottom side of the extrusion showing, so first I'll click the Mesh button in the Properties panel and then go to the Rotate X control on the text and drag down. I'll finish by going to the Layers panel, right-clicking (PC) / Control-clicking (Mac) on the text layer, and choosing Rasterize 3D.